Happy February! I am so excited to have the French Kiss collection to decorate my Ladybug Daily Doodles planner this month. 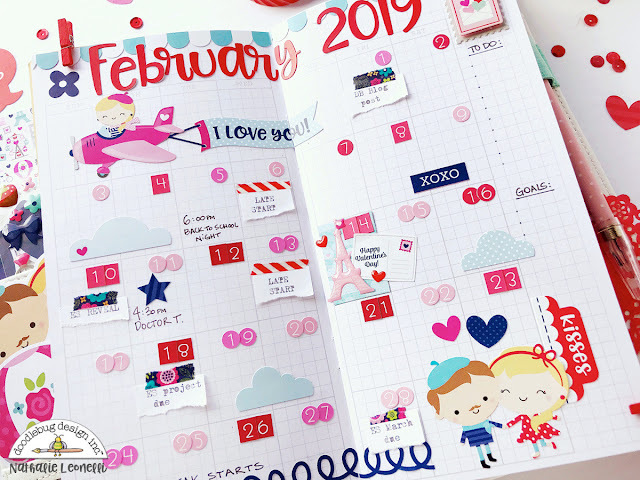 I started off by using many of the fun goodies to create my monthly layout. I love the way it turned out. The Paris and love themes are just perfect for this design. Firstly I added some washi tapes to the top and bottom of my insert. Then, I used the number stickers from the Ladybug, Bubblegum and Swimming Pool Teensy Type sticker sheets. I love mixing up the number fonts! There was plenty of space to add some fun details using the Odds and Ends die cuts as well as some stickers. Of course, I always love using planner clips. I adhered the Special Delivery Doodlepops to some paper clips using hot glue. I also designed a large page clip using a piece of patterned paper adhered to an oversized paper clip. 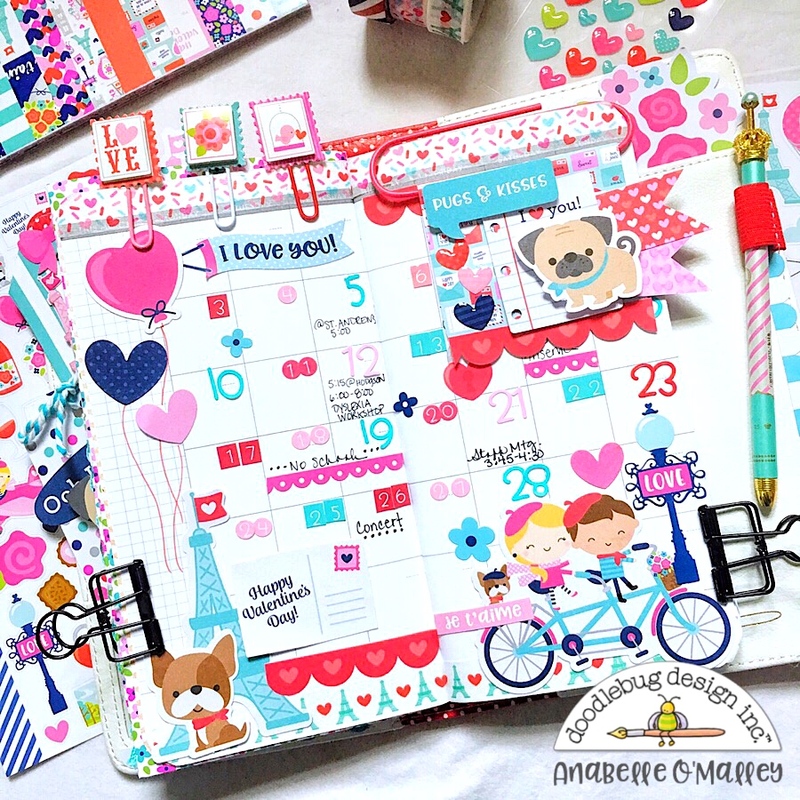 Embellishing it with this adorable pug Doodlepop and some other details was so much fun and really adds so much to my calendar spread! 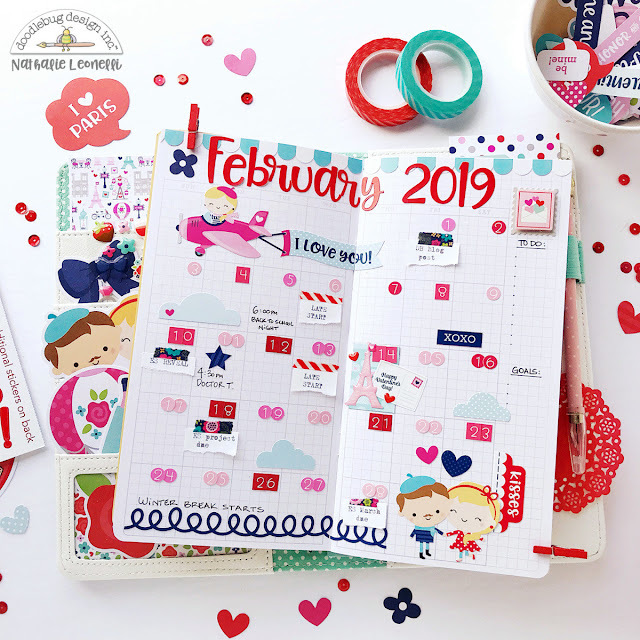 I am still very much in love with the French Kiss collection and, with it's Valentine's theme, it was perfect to decorate my February monthly spread in my Daily Doodles calendar insert! My first step was to use three colors of Teensy Type alphabet stickers for the dates and some Abigail alphabets (in Ladybug) for the month and year. I then played with lots of stickers from the Icons and the This & That sheets. I wrote some of my reminders directly in the boxes but sometimes I added little typed notes that I adhered with washi tape (makes it easy to switch dates in case of changes!). I created a column on the right for 'to dos' and monthly goals with one of my favorite Doodle-Pops on top. I also paid extra attention to the 14th and placed an Eiffel Tower shaped Sprinkles on a small piece of patterned paper from the 6x6 French Kiss pad. There's nothing more motivating that looking at a pretty planner page! February, I'm ready for you! Complete Planner Envy!! Fabulous spreads!!! !